"After the two effects we have about six amplifier outs. Two of the outs go to my Voodoo Modified JMP1 Marshall heads. The Voodoo mods make these amps amazing. They sound so much better than they used to. We have two of them: the main one is setup for Billy's main dirty sound and goes to the Marshall 120-120 power amps; the second Marshall JMP1 has a clean sound that goes to a direct box straight to tape for recording purposes because they record every night," says Billy Gibbons's guitar tech about the Marshall JMP-1 Tube MIDI Guitar Preamp. A Marshall JMP-1 Tube MIDI Guitar Preamp appears in this Josh Klinghoffer rig rundown video. According to Jason and his guitar tech, Calvin Roffey, who were interviewed for the making of this rig diagram, Jason had a JMP-1 preamp in his rack gear. In this concert of 1994 Geordie is using a Marshall JMP-1. The preamp can be seen right at 4:34. In this rig rundown at 0.50 Dusty's tech goes through his signal chain. 1994 interview Guitar World - REZNOR: Almost everything was direct--there was almost no miking of cabinets. I just don't like that sound very much. It sounds boring to me. So we ran through a variety of preamps and speaker simulators. Our main preamp was the new Marshall JMP-1. But I didn't use the speaker simulator in it. I took the direct out of the Marshall into the Zoom 9030, employing just the speaker simulator on that. [This article](http://www.premierguitar.com/articles/Rig_Rundown_Bushs_Chris_Traynor), by Premier Guitar, states that Traynor "uses a Mesa Boogie Dual Rectifier (first revision) with a Divided by 13 FTR 37 (not pictured), which he also relies upon heavily in the studio. He likes combining the characteristics of multiple amps to achieve his tone, also using a Marshall EL34 100/100 and a Marshall JMP-1…"
@ 10:37 of this video it shows Phil's 2 Marshall JMP-1's. Phil has 2! "Your live rigs have changed quite a bit since the late ’90s. Ken, you used to rely on a Marshall JMP-1 preamp and VHT 2150 stereo power amp into a Marshall 4x12, while Greg was using an Ampeg SVT II head with a matching 2,000-watt 8x10 loaded with David Eden speakers. 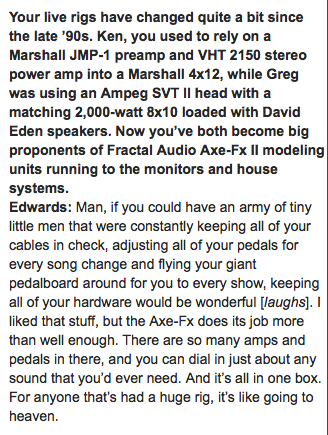 Now you’ve both become big proponents of Fractal Audio Axe-Fx II modeling units running to the monitors and house systems," reads [this article](http://www.premierguitar.com/articles/22683-failures-monster-comeback?page=2). Rack-mount pre-amp with 4 channels (2 clean, 2 overdriven), MIDI connections, programmable stereo effects loop, and speaker emulation. When playing live, James has not one, but two Marshall JMP-1 pre-amps beneath one another. to quote the important part of the article in a verbatim manner: "For the second record, Thompson started using a Marshall JMP-1 pre-amp. Shortly thereafter, he came across the VHT PitBull Ultra Lead, which he switched to and used on the next few records." At 1:10 in this video, one can see Jody Davis' rack, which has a JMP preamp along with a G-Force. In [this interview](http://www.emusician.com/gear/1332/signal-to-noise-the-sonic-diary-of-the-smashing-pumpkins/40242), it says, "He still had his Marshall 1960A cabinets, but Corgan shifted to a Mesa Boogie Strategy 500 and a Marshall JMP-1 preamp (Corgan also notes that he used an Alesis 3630 to drive extra gain into a Marshall)." Vivian uses two Marshall JMP-1 preamps, according to [Guitar Geek](http://www.guitargeek.com/vivian-campbell-def-leppard-guitar-rig-and-gear-setup-2011/). At 0:33 of this private gear tour, Stephen Carpenter of [Deftones](http://equipboard.com/band/deftones) shows off some of his gear, including a Marshall JMP-1 Tube MIDI Guitar Preamp. You can see at 33:18 the gold Marshall preamp in the rig. In this video, Herman Li is shown using a Marshall JMP-1 going into a Laney head and cabinet that's power-amping his JMP-1. "When Chris re-joined W.A.S.P. for the KFD album and tour he was using Marshall JMP-1 preamps and Alesis Quadraverb 2 effects processors." On band site Equipment Used: 2 Cort G series guitars. A Marshall JMP-1 Preamp. 2 Valvestate 80/80 poweramps. Two Marshall JMP-1 Tube MIDI Guitar Preamps (ones a spare) exist in Mike's setup. In this 1996 Guitar Player Magazine [interview](http://www.robinguthrie.com/interviews/guitar-player.php), Robin Guthrie says: "for the more distorted sounds I use a Marshall JMP-1 preamp." At 1:36, Dave Murray, of [Iron Maiden](http://equipboard.com/band/iron-maiden), has two Marshall JMP-1 being displayed. Jerry Horton of [Papa Roach](http://equipboard.com/band/papa-roach), states, "I use a Marshall JMP-1…", in an [interview](http://www.guitarplayer.com/miscellaneous/1139/papa-roach39s-jerry-horton-on-tones-riffs-and-survival-skills/17013) with *Guitar Player*. on this video at 23:15, Tim McCord use this guitar preamp. This article lists Frank’s gear. This video, which was taken at a talk show in September 11th of 2016, shows three guitarists performing selections of their own compositions before doing an interview, followed by a jam session. Syu is shown to use a rackmount Marshall JMP-1 to emulate the high-gain tones for his solo performance. This can be seen at the beginning of the video, exactly at 0:03. "with a Marshall JMP-1 Preamp"
Ive wanted one of these since hearing "Mellon Collie"
I have been tempted to buy one of these for when I want channel switching ever since the 90s and always chicken out because of all the ICs involved in the circuit, its just so untubey, but people who hav them love them, so...... either those people are crazy or I should break down and get one? put an alesis 3630, 3631 or any studio VCA unit with soft knee in the loop, set for mild grab and a huge make up gain boost and you will have the preamp sound of every dirty MCIS rhythm tone short of 'to forgive'. Do more grab and less makeup gain on a clean channel and you have the clean tones sans effects. You don't even need the mesa power amp, DI it and then throw an impulse of a stock 1960B cab powered by a tube power amp on it and that's that. Not a easy to cop the ZZ top live sounds though. This was supposed to approximate every Marshall tone you could think of but it se approximation of anything but the higher gain heads like the jubilee and the 900s. Not one of my favorite pieces of kit when I had it but I miss it now that its gone because it has its own sound. These have become quite expensive as of late.